I'm a bit late wrapping up the April/May closet theme. It's June and way too hot to be fussing around with closets. So I'll keep my last bit of advice simple - accept your craving for novelty. You know how you keep great clothes because there is nothing wrong with them and you used to love them? But they just sit there, unworn? You got bored. It's OK. It's one of those things that separates you from the animals. Animals vary their look from season to season but never from year to year. You're dealing with a basic human trait that has kept the fashion industry afloat year after year. Get rid of the stuff that bores you and make way for something exciting and new. It also explains why the coral snake can be happy in his own skin for a lifetime, but I require at least three. those shoes in the first picture took my breath away. so amazing. Amen, we should all shed what we no longer love or wear or fit. Thank you for this reminder! :) indeed!!! once i'll get back to ny i have to take a pic of my snake paraphernalia! "It's one of those things that separates you from the animals. Animals vary their look from season to season but never from year to year." 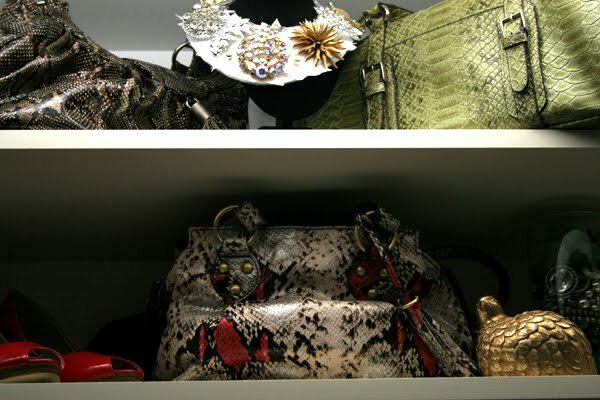 Uh, I actually have FOUR snakeskin bags. Forgot about the yellow one just out of the frame.